I have been waiting months to post about these two projects! Back in December, I submitted two project proposals to Shannon Okey, the editor of Yarn Forward Magazine. They were accepted, but I needed to turn around both projects in 6 weeks! Indeed, this winter’s frantic knitting frenzy partly explains the major burnout I feel now. 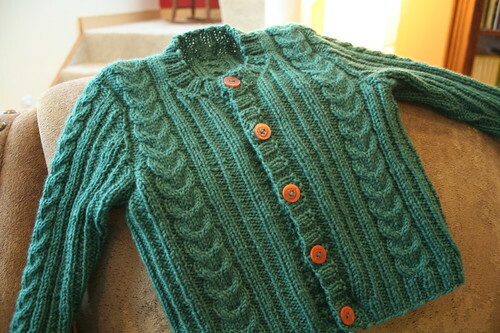 Or more likely, finishing the Katharine Hepburn Cardigan crushed my will to knit. 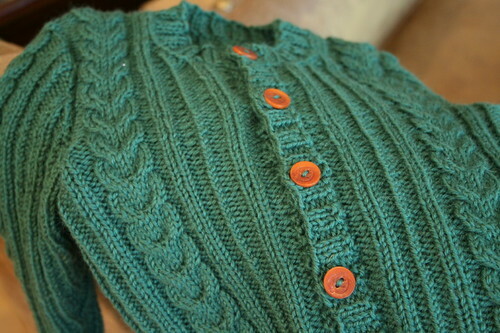 I intended this to be a functional, unisex baby cardigan. All of the pieces are worked flat and seamed together, although it would not be hard to knit this seamlessly in the round. 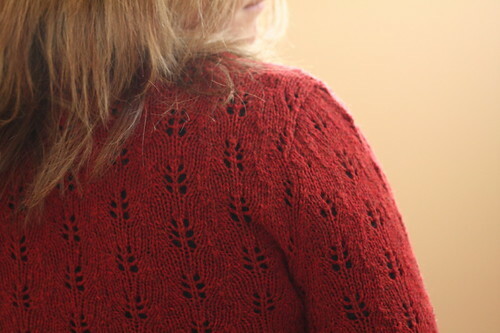 I used some Dalegarn Heilo I bought last fall while visiting my parents on Cape Cod. 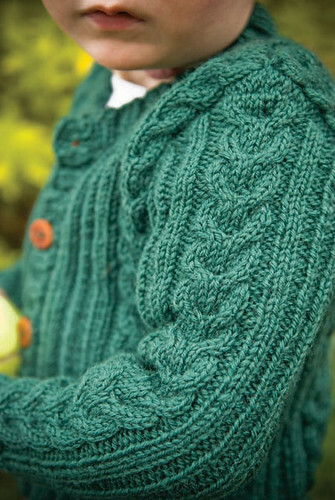 Heilo offers wonderful stitch definition for cables! Unfortunately, Beatrix was not at home when Green Day came off the blocking table and since it went straight into the mail, I do not have modeled photos of this! 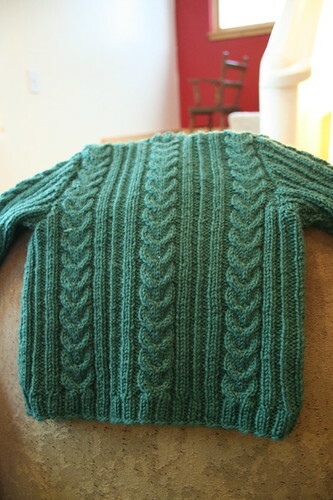 The second pattern, Scoopneck, is due out next week in the next issue of Yarn Forward. I designed this specifically with wearability in mind. 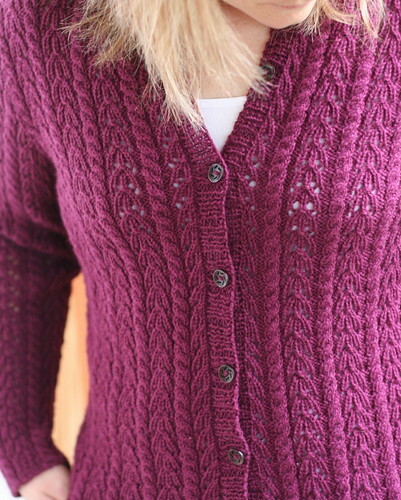 The yarn is one of my favorites (Harrisville Designs New England Shetland); it is light and airy but offers a tremendous amount of warmth with really wonderful drape. Besides, it comes in 56 amazing and tweedy colors. What’s not to love? The lace pattern is simple and easy to memorize but does not interfere too much with the body and arm shaping. 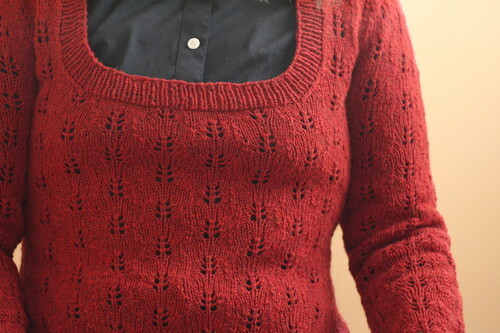 Scoopneck is knit in the round to the armholes, when the sleeve caps are worked back and forth; the shoulders are joined by a three-needle bind-off to minimize seaming. This project was actually the first one in which I used Aaron’s set-in sleeve calculator. Not a bad fit, eh? Math is brilliant when someone else does it! Although a British publication, Yarn Forward Magazine can be found at Barnes & Noble and some LYSs in the US; copies can also be purchased online here. 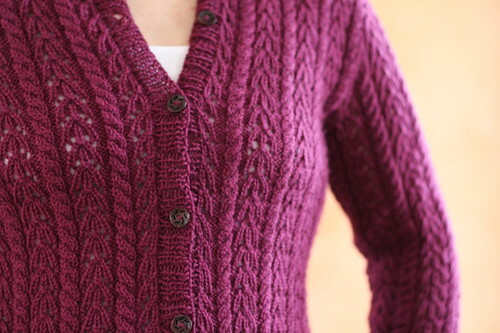 When the pattern rights revert to me later this fall, I will offer the pattern for sale here. 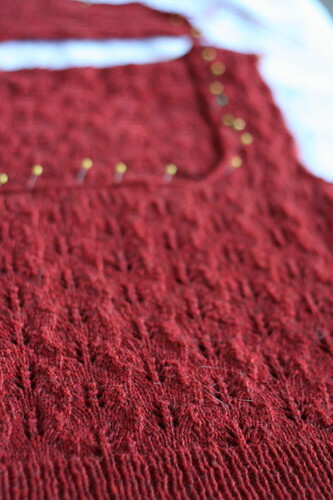 This cardigan has plagued my knitting basket for such a long time (since October 2007) that I know not what to say about its completion. Good riddance, perhaps! I cast on while studying microbiology, and it immediately became clear that this pattern would never be a good study companion. The 12-row pattern repeat is simple – dull, even; however, it is just complicated enough to command attention. Since I almost exclusively knit while doing other things, the Katharine Hepburn Cardigan languished 18 months before I finally finished it. In fact, I would say that I only finished it out of spite. The color is beautiful, but it really is not for me. I am not even so sure the style is right. This might have to stew in the cedar chest until I forget my complaints with it. The only modifications I made were to lengthen the body a little, knit the sleeves to full length, and reshape the sleeve cap a little bit. Although the knitting proved miserable, the pattern itself was very clear, well written, and accurate. The faults are entirely my own, not the designer’s. I should have known better than to jump into this one. Lesson learned the hard way.